UNMC and Nebraska Medicine have a goal to divert 90% of our waste from the landfill by 2030. One of the easiest actions for all individuals to take is recycling an item once it can no longer be used. We currently recycle 26% of our waste; this is an improvement on our baseline, but we still have a ways to go. Unfortunately for us, China has decided to be more selective on the waste/recycling they take from other countries. While very little recycling from Omaha ends up there, this change has created a domino effect that does impact us. The change that is the most important to note is contamination. If recycling streams contain too much contamination the entire load will be sent to the landfill. Contamination can occur in 2 ways; having trash/recyclables in the wrong stream (pop can in the paper container, or potato chip bag in the plastic container) or trash mixed in with recycling. This is most common is food/drink still in the item. Do I need to wash my recyclables before placing in a bin? In short, no. Beverage containers need to have the liquids emptied, but they don’t need to be rinsed/washed. Food needs to be removed and soiled items (greasy pizza box, etc.) should be placed in the trash. Containers don’t need to be washed, just get the bulk of the food/sauce out. E.g. eat all the yogurt, no need to clean, or use your napkin to dump the lasagna you didn’t eat into the trash, no reason to wash it. We’ve made good progress, but have work to do. Paper: Put mixed paper in the blue bins. 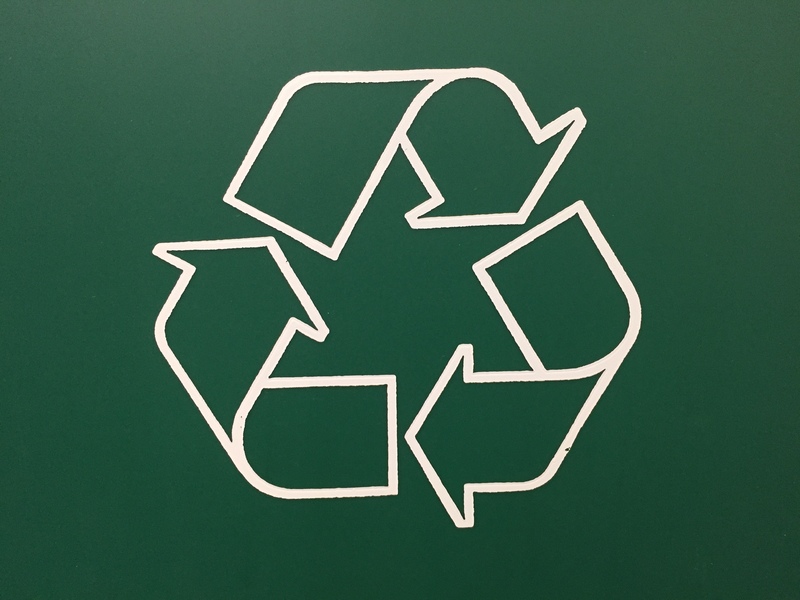 Virtually all paper products on campus can be recycled: copy paper, envelopes (including plastic windows), scratch paper, glossy paper, construction paper, clean food packaging, newspaper, receipts, post-its, notebook paper. Cardboard: All Corrugated cardboard (boxes used for shipping) and standard cardboard (sometimes referred to as paperboard: facial tissue/cereal/frozen meal boxes) can be recycled on campus. Please break all boxes down flat and place them between your paper recycling bin and the wall or at the designated location for your building. Metal: Metal should be placed in the green bins, along with plastics. These materials include aluminum (pop) and tin (soup) cans, but small metal shipping containers and other metals can be recycled too. Plastic: Plastic is recycled in the same container as metal. All plastics that go in the green bins need to be rigid. Any items that holds shape on its own can be recycled, i.e. bottles, frozen meal trays, plastic dinnerware, yogurt cups, lids, straws, can all be recycled. Soft plastics like plastic bags, plastic wrap, bubble wrap, cellophane cannot. Other items can be recycled at the Med Center; including aerosol cans, furniture, electronics and toner cartridges. For more information see the LiveGreen Recycling page. Thank you for helping us get to our Zero Waste goal!